A delicious traditional New Orleans dinner dish made with rice, spices and your choice of meat or seafood (or both). Each package plus one pound of meat or seafood makes six cups of Jambalaya with a total preparation time under 30 minutes. Great with chicken, ham, sausage, shrimp or game. 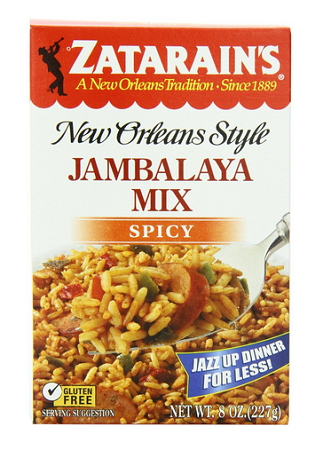 Zatarain's Spicy Jambalaya offers the flavor and soul of New Orleans with more heat. This is an 8oz box.